Old age is a time to think and see things in a more “true light,” says Mrs Elizabeth Nelson, who today celebrated her 103rd birthday at Havelock North’s Duart hospital. Mrs Nelson, who spent a busy life nursing, including World War I service, today reﬂected on the past as she welcomed birthday callers. “You were here just a while ago,” Mrs Nelson said, referring to a Herald-Tribune visit on her 100th birthday in 1976. “I have been looking forward to this day and I am still in good health for my age. “The most frustrating thing is when the old body wants to be active. I can still exert myself, but if I overdo it I have to pay later,” she said. Mrs Nelson said the main thing is learning to be quiet and content and use the time to think. “I must not mind if I am blind and deaf. That is the way of nature. “There is no use getting troubled and upset – with time to think you get more idea of the truth. You see things more clearly,” she said. Mrs Nelson said she had been looking forward to her birthday, but says she is ready to die. “If you are ready that takes a lot of frustration and worry away. “Some days I feel I might ﬁnd myself gone the next morning. It might happen today with the extra excitement but I am ready,” she said. However, it was a struggle to decide between that and writing. Writing became her hobby. Born in Waipawa, Mrs Nelson began her nursing career in Napier, trained in Wellington and served in Egypt and England during World War I before establishing a convalescent home in Napier. 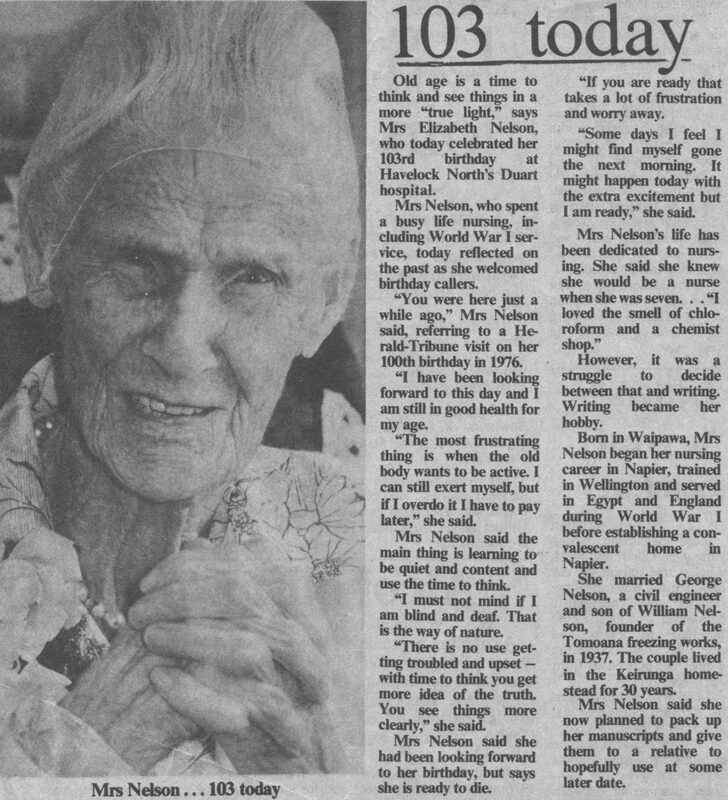 She married George Nelson, a civil engineer and son of William Nelson, founder of the Tomoana freezing works, in 1937. The couple lived in the Keirunga homestead for 30 years. Mrs Nelson said she now planned to pack up her manuscripts and give them to a relative to hopefully use at some later date.